The little one absolutely loves to read. Sometimes we read 15 or more books in a single day! She has quite a few books but definitely not enough to keep up with her appetite for reading, so last week I took her to the library for the first time. We checked out a bunch of books, and when I was trying to figure out a way to carry all of them around the library and then home, I realized that Hannah definitely needed a tote bag. 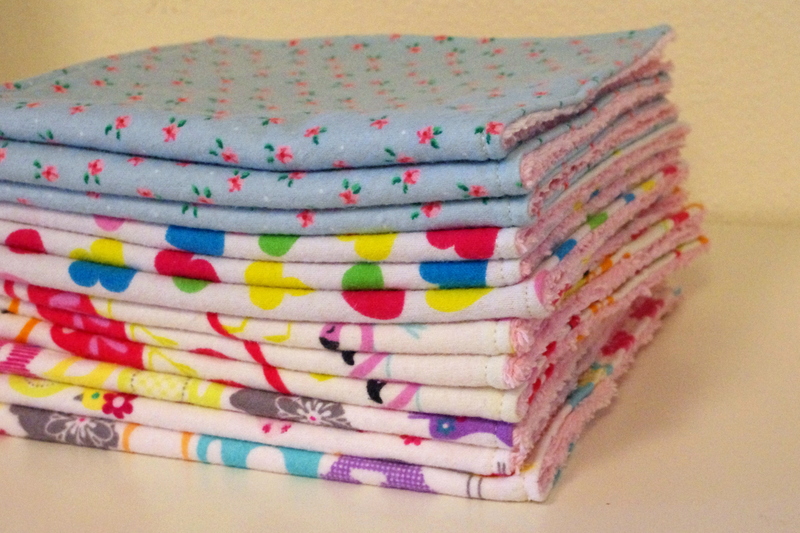 Since Aunt Pam was generous enough to send me a ton of cute fabric, I looked through my new stash to find a fun girly print. I absolutely loved the pink with sparkly wands the first time I laid eyes on it. What girl wouldn’t?! When I look at it I think of princesses and fairies and magic. How perfect for a library tote bag! Another Aunt Pam goodie was the multi-colored cat print. I knew that it was destined to become something for my mom since she loves cats so much. Anytime I see something with cats, the first thing I think of is my mom. 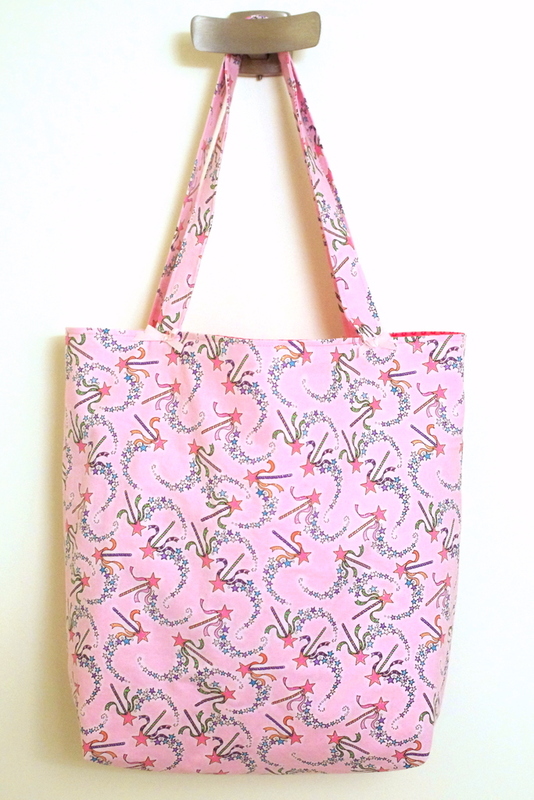 I couldn’t figure out what to make, though, until I got the idea to make a tote for Hannah. 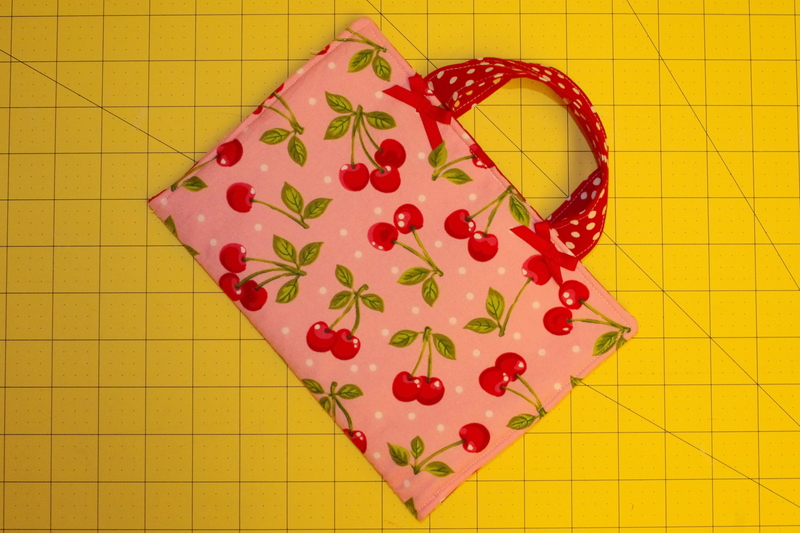 A tote bag is so functional and since my mom loves to travel, whether it’s a day trip or a week long trip, a tote bag is a great thing to have on hand. 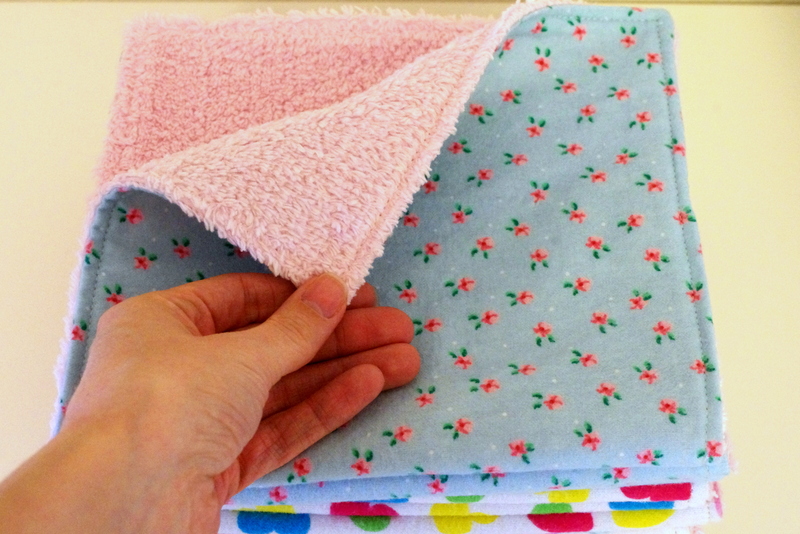 I’m thinking of whipping up something else for my mom too with the leftover cat fabric. More to come on that another time! 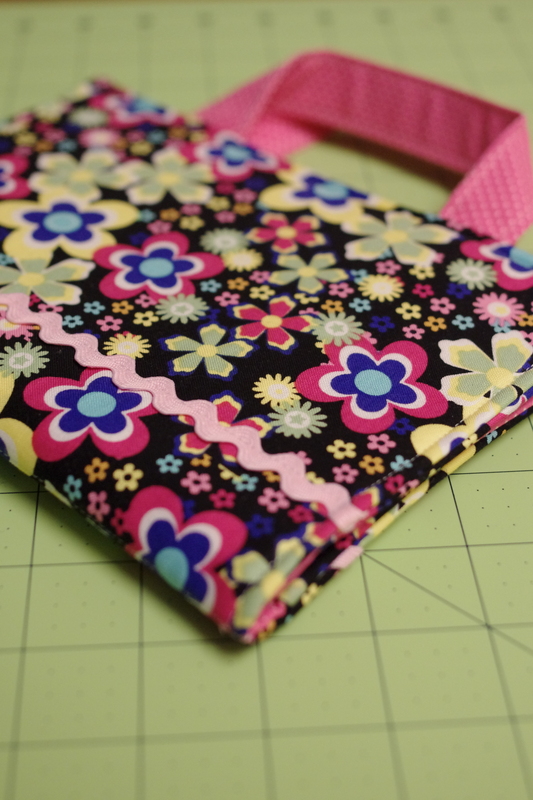 To make the bags, I used the tote bag tutorial from the blog Skip to my Lou. 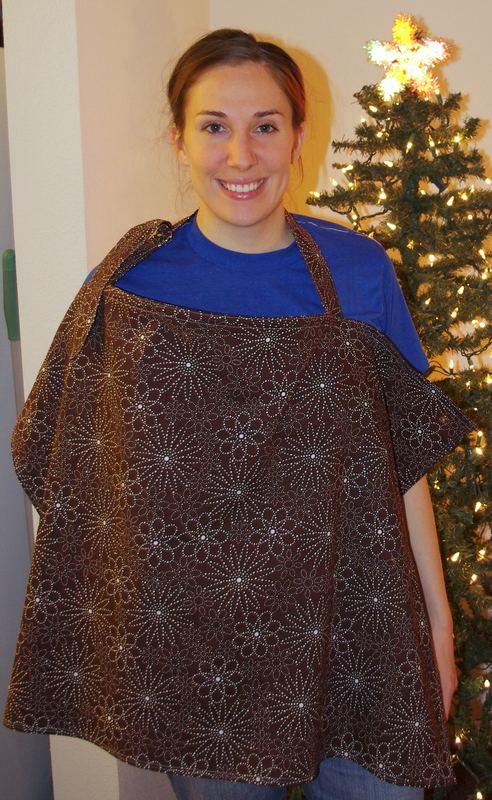 There are a ton of tutorials for totes but this was perfect. 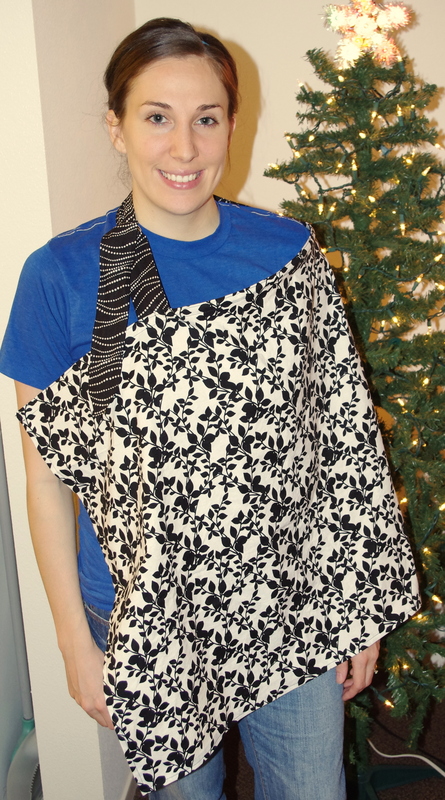 Super quick and easy, and by that I mean no interfacing. Wahoo! 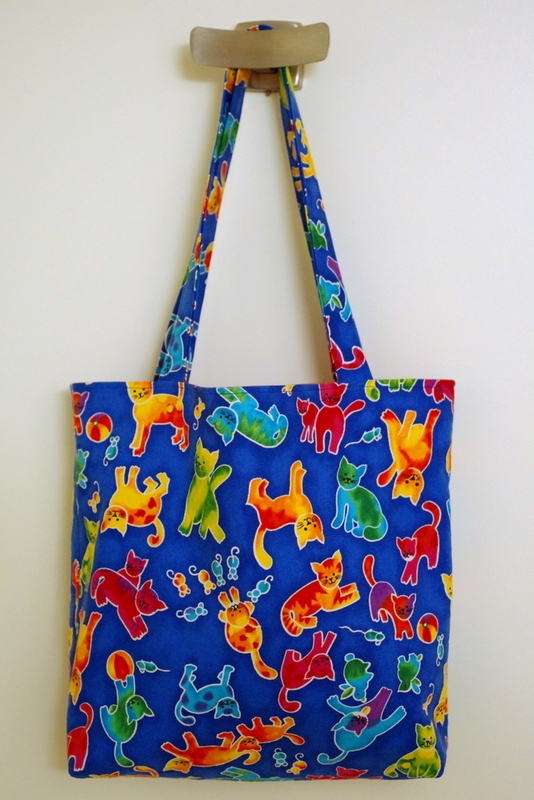 I followed the tutorial completely for the cat tote bag. 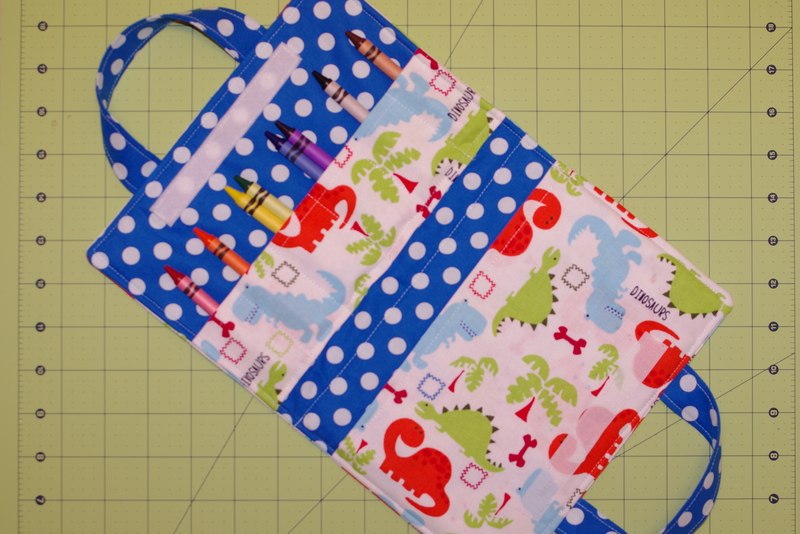 For Hannah’s bag I increased the size by two inches on both the length and the width, and I sewed the bottom corner two inches instead of one and a half so that the bag would have a wider base and could hold more books. 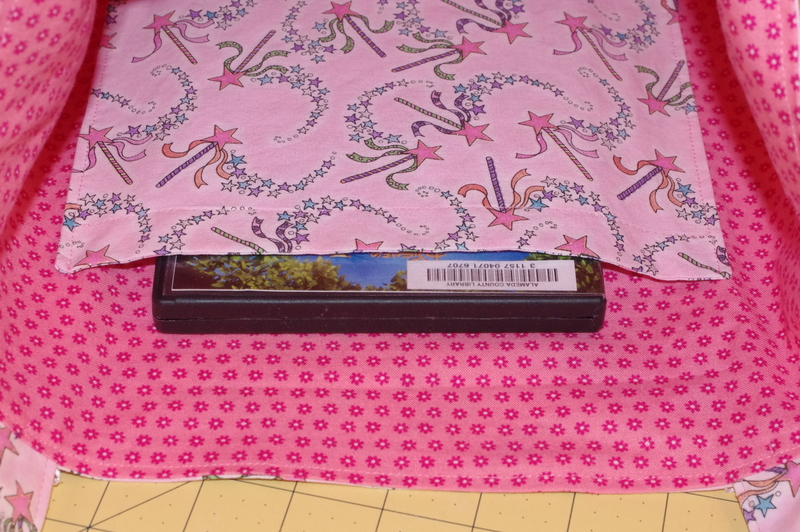 I also made an interior pocket for Hannah’s bag because I wanted a place to store CDs and DVDs where they would be at least somewhat separated/protected from the books. 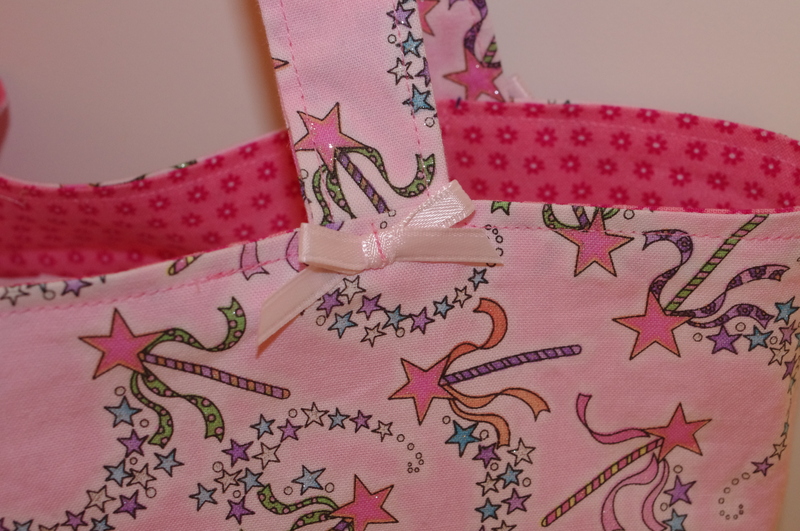 And what girly tote would be complete without some fun bows! After some procrastination, I finally finished the remaining two Crayon Art Folios on my to-do list for the kiddos in my Bible study. The funky flower folio was the for the oldest girl and the dinosaurs were for the only boy. It was kind of fun to make something for a boy. As much as I love the girly stuff, it’s always nice to branch out. 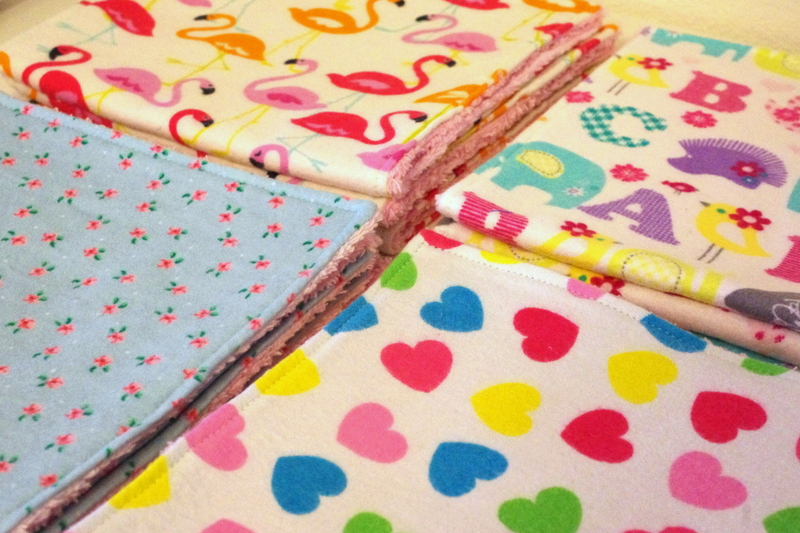 I thought it would be fun to dress up the folios for the girls with some extra details. For the younger sister, girly bows (see previous post), for the older sister, some ric-rac to go with her funky flowers. 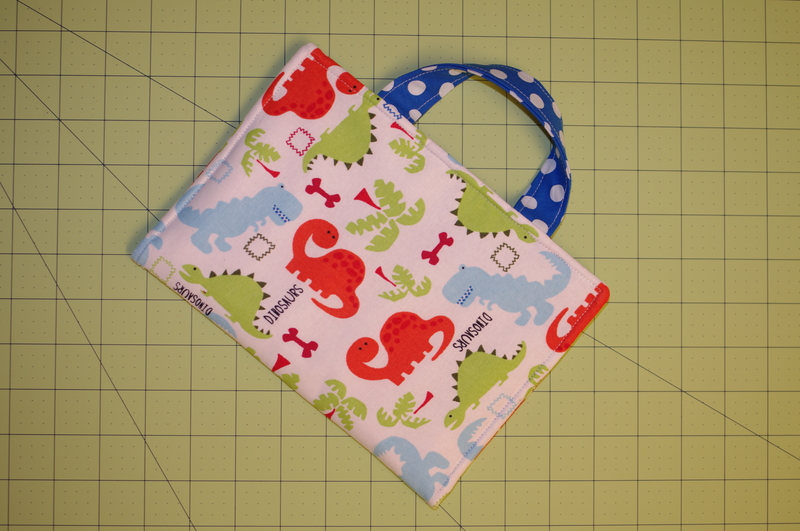 I love the dinos, especially with the blue polk-a-dot accent fabric. 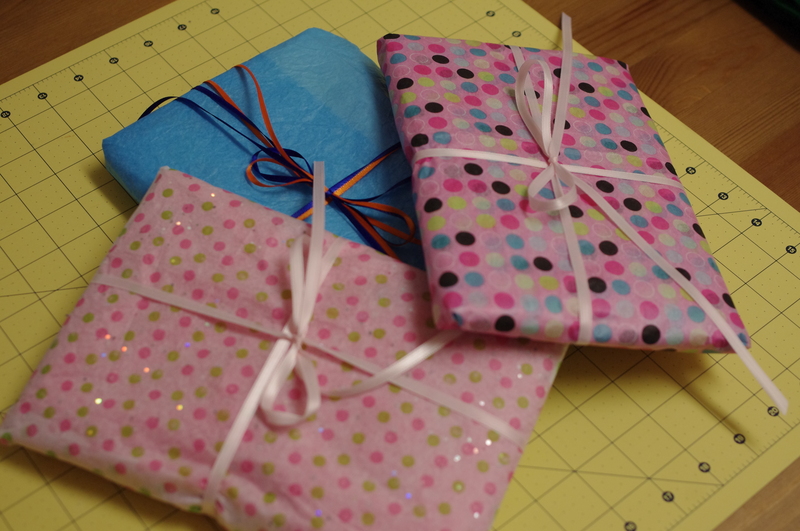 All wrapped up to give to the unsuspecting birthday kiddos. 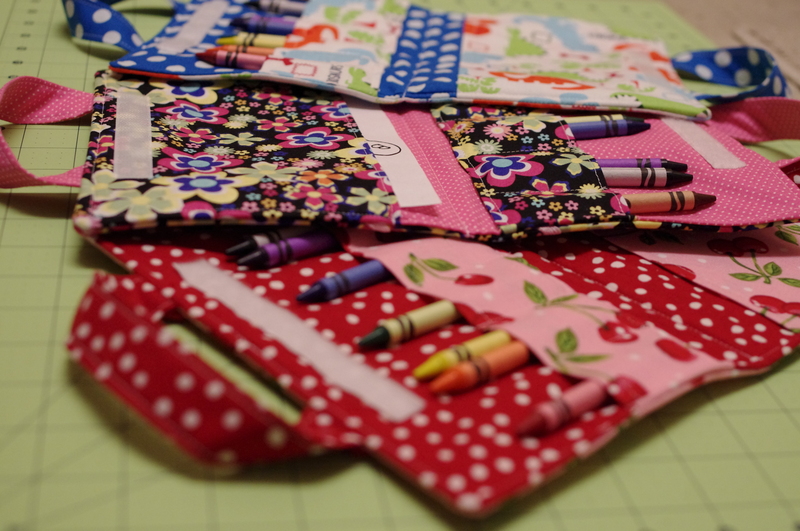 Since I’ve been perusing the various mommy sewing blogs, I’ve come across so many great ideas, not only for clothes but also for toys, activities, and other children’s accessories. 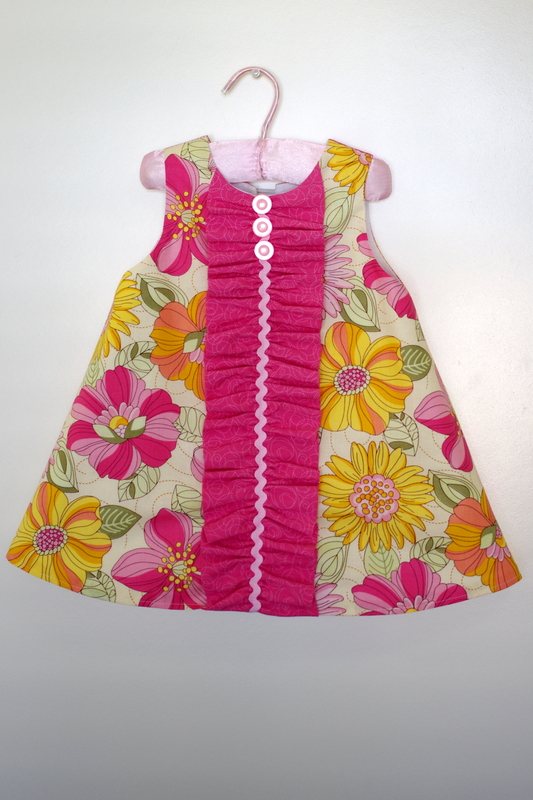 And lately I’ve had a hankering for making something other than clothes, although adorable baby dresses are definitely a lot of fun to make. The first Crayon Art Folio of the three I plan to make is for the younger of the two girls. 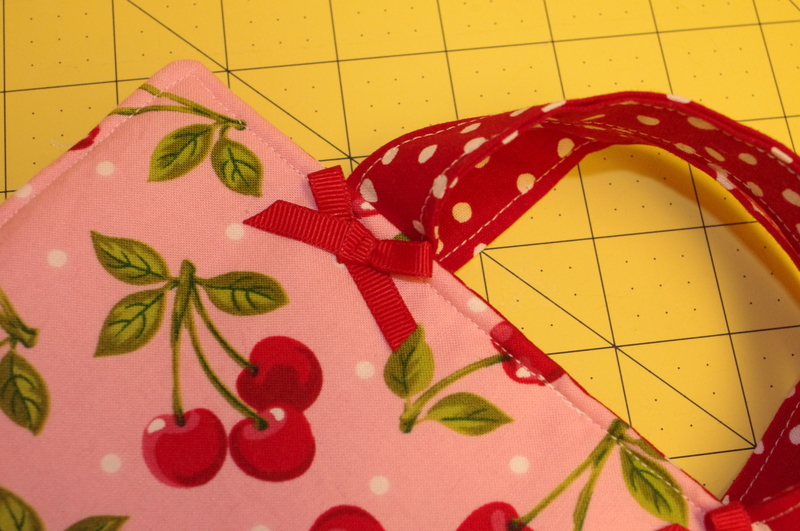 She’s a girly girl and I think that this adorable cherry fabric suits her. 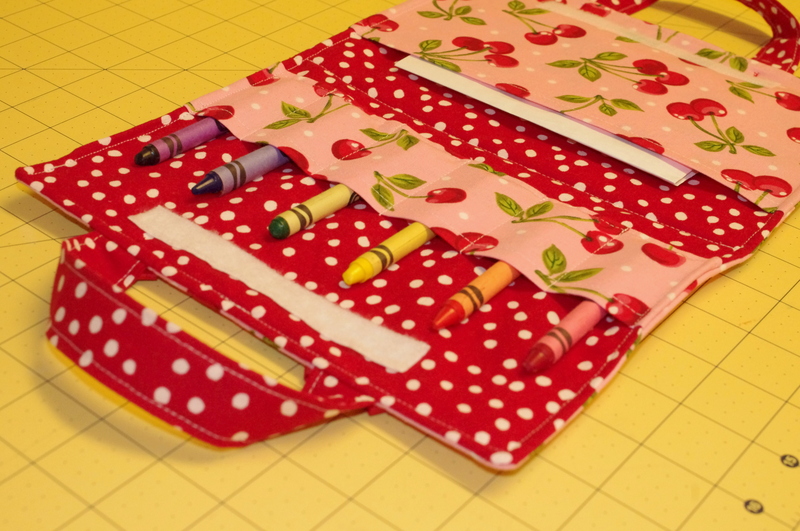 For extra girliness, I added the red bows at the base of the handles on both sides of the folio. 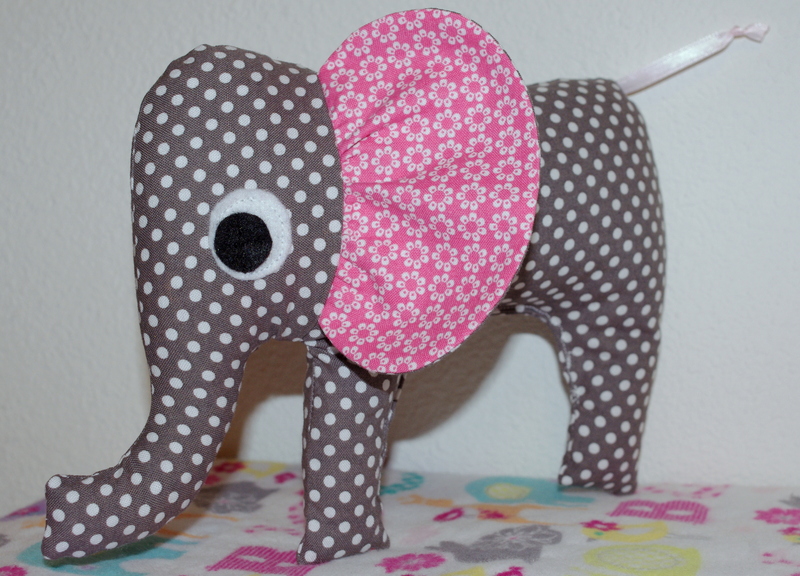 Such a cute detail! 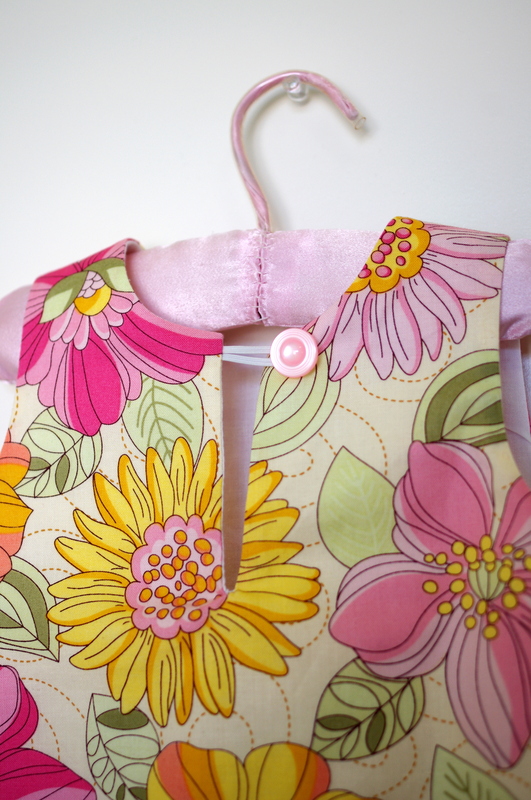 It’s amazing how the smallest embellishments can really complete a project.